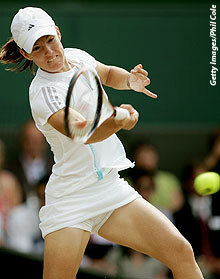 New Haven, Conn -- Justine Henin-Hardenne, currently the No. 3 ranked player in the world and the 2006 French Open champion, has entered Pilot Pen Tennis presented by Michelob ULTRA, a US Open Series event on the ATP and Sony Ericsson WTA Tour set for August 18-26, 2006 at the Connecticut Tennis Center at Yale, it was announced today by Anne Worcester, tournament director. Henin-Hardenne joins an already deep field that includes World No. 1 Amelie Mauresmo, defending champion Lindsay Davenport and top-ranked players Elena Dementieva, Anastasia Myskina, Francesca Schiavone, Dinara Safina, Anna-Lena Groenefeld, Daniela Hantuchova, Maria Kirilenko, Na Li, Shahar Peer, Jelena Jankovic, Nathalie Dechy and Elena Likhovtseva. Henin-Hardenne, holder of five Grand Slam singles championships (2003 US Open; 2004 Australian; 2003, 2005-06 Roland Garros) and 27 career singles titles, has not played a tournament since her appearance in the Wimbledon final. The former World No. 1 skipped San Diego and Montreal due to a knee injury, and has chosen to play New Haven as her lead into the US Open. This will be Henin-Hardenne’s fourth appearance in New Haven. The Pilot Pen is the first ever combined men’s and women’s summer tournament leading into the US Open. Some of the ATP stars who have committed to the 2006 Pilot Pen include James Blake, Nikolay Davydenko, Jarkko Nieminen, David Ferrer, Fernando Verdasco, Jonas Bjorkman, Paradorn Srichaphan and Feliciano Lopez. A few of the Sony Ericsson WTA Tour stars that have committed to the 2006 Pilot Pen include Lindsay Davenport, Amelie Mauresmo, Elena Dementieva, Anastasia Myskina, Francesca Schiavone, Dinara Safina, Anna-Lena Groenefeld, Daniela Hantuchova, Maria Kirilenko, Na Li, Shahar Peer, Jelena Jankovic, Nathalie Dechy and Elena Likhovtseva. The 2005 Pilot Pen drew 100,000 spectators and was televised nationally on 20 hours of ESPN2 and CBS Sports. For information on tickets, travel packages, sponsorships or on how to become a volunteer at the 2006 Pilot Pen, call the Pilot Pen Tennis office at (203) 776-7331 or (888) 99-PILOT.